Twilio exposes a globally available cloud API that developers can interact with to build intelligent and complex communications systems. Thousands of developers use Twilio on a daily basis, and Twilio has developed a comprehensive knowledge base to provide answers for users who are getting started. To help users find answers faster, Twilio came to Swiftype to implement a powerful search engine. Great search without the need to involve engineering, rich analytics, and customization opportunities. Before Swiftype, search was not a prominent tool in the Twilio knowledge base - primarily because it didn’t work well. Aside from the fact that the search bar returned results that were not relevant, any improvements the team wanted to make to their search algorithm required heavy amounts of back-end development work. Twilio needed a solution that would provide them powerful search without the work. Once Twilio made the switch to Swiftype, they had a new search engine up and running in minutes. Now that search worked well for the knowledge base, Twilio decided to feature it prominently on the page. Within the company, people were immediately excited by the autocomplete drop down results. The change was easy on Twilio’s end and employees could quickly see how much better this made their user experience. 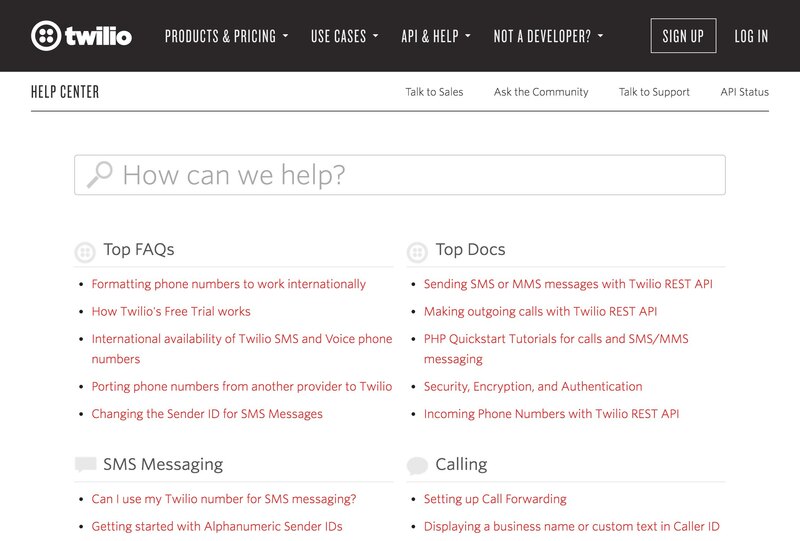 After getting their search engine up and running, Twilio’s support team used their Swiftype dashboard to customize the results for the most popular queries. With the drag-and-drop result ranking tool, Technical Support Engineer Joshua Atkin rearranged results for the top 50 queries to make sure the best results were easy to find. Perhaps more importantly, Joshua also added in results for queries that were returning no results to minimize the need for users to file support tickets. These dashboard analytics not only helped Joshua customize existing search results, but also helped him and his team determine what new support articles needed to be created. Before Swiftype, the Twilio support team had a sense that there was inadequate documentation surrounding session initiation protocols (SIP), but never had time to develop articles for users who had SIP questions. However, when they saw how many users were searching for help on SIP, they realized they needed to create something quickly, so the team worked to develop an FAQ section. Now, Twilio spends less time answering support tickets on SIP because users can quickly find the information they need through the knowledge base.